From the discomforts of nicotine withdrawal to the thoughts of smoking that come up now and then as we move through the first year of smoking cessation, recovery from nicotine addiction is a process that can be difficult to maintain control over. Deep breathing is an invaluable tool that, when mastered, will help you shift gears when nicotine withdrawal makes you edgy. 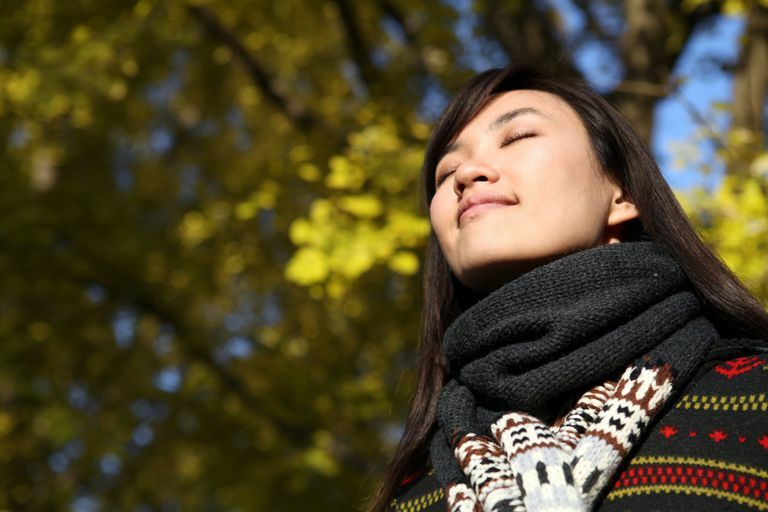 Think of deep breathing as a compass that will help you find your smoke-free way and relax you at the same time. I'd like to introduce you to Leslie. In this article, Leslie shares the techniques she uses to control her breathing, along with the benefits that deep breathing has had for her personally. As of this writing, Leslie has 9 smoke-free months under her belt and is feeling stronger with every passing day. Something so natural, so intrinsic and invaluable an activity, so...common. The average person takes 12 breaths per minute, but it's barely something we're aware of. With yoga having become as mainstream as sliced bread, we are now given tools to learn how to breathe more deeply, more to the core. If you're into yoga, that is. I always thought it was a romantic concept -- standing still and quiet, arms clasped together in reverence, salutations to the sun. So I bought a DVD on it set in a calming desert surrounded by gorgeous colors and set to exotic and peaceful music. I know that yoga is a form of exercise that takes commitment and practice, but I could never quite wrap my head around it -- not to mention my body -- although I would love to try it again sometime. All attempts aside, one thing I found absolutely invaluable was being taught the awareness of breathing, of life's sweet breath. Breathing properly is an absolutely crucial tool in the first days and weeks of smoking cessation. I recently read a forum member's post describing how, in order to get the most nicotine out of a sickorette, we breathe more deeply than we do otherwise. This may explain in part some of the sense we get as smokers that we are 'relaxed' when smoking. When we first quit, we tend to take far more shallow breaths, the opposite of what we should be doing in order to stay focused and calm. It is amazing how profoundly and immediately a deep breath will calm one's nerves. Place your tongue on the roof of your mouth and breathe in through your nose. Keep breathing in until your lower stomach starts to rise. (This is also known as diaphragmatic breathing, and really helped me as an asthmatic). Then, put your lips together as if you are blowing up a balloon. Blow all the air out slowly in a controlled manner until it is all gone. Breathing out should take almost twice as long as breathing in. Now for the 'magic'. When you have practiced this breathing technique and understand what to do, you will start to feel a change in your body. It is important that you take notice of this -- the drop of the shoulders, the loosening of the face, and any other feelings you may have. When you have mastered this, each time you take a deep breath, you can say a word. It can be any word, such as RELAX, CALM, PEACE, QUIET, or anything else that has meaning for you. The word should be repeated over and over again in your mind as you breathe out. Very shortly, all you will have to do is say the word and your body and mind will instantly return to that calm state. You can do this anywhere and at any time and no one will even know you are doing anything differently. The control of breathing is important. The faster one breathes, the more oxygen is being taken from the brain and the more anxiety is felt. Control your breathing and you will release the brains' own 'feel good' chemicals called endorphins. With practice, you will be able to change your mood whenever you want. In a way, smoking is like a negative deep breathing exercise. You say the word 'cigarette' and your body reacts by becoming tense and anxious. You light a cigarette, and by taking that first deep breath, you are doing exactly the same as taking a deep breath without a cigarette, though as a smoker, you attribute the change in feeling to the cigarette itself, which actually hasn't done anything. Note from Terry Martin: Much of the relaxation that we associate with smoking has to do with replenishing the dwindling level of nicotine in the bloodstream. We think of it as smoking enjoyment or stress relief, but it in truth, the only relief we get from smoking is that of a junkie getting a fix. Nicotine is an extremely addictive drug, and we get edgy and uncomfortable when the nicotine level in our bodies dips below what we're used to receiving. This next one is one of my very favorite exercises, and never fails to take the edge off of whatever stressful or tense day I may be having in life. Stand up. Right now, go on, you can do it (or if you can't, then sit up straight with both feet firmly planted on the ground). Lift your arms as high up as you can. Now close your eyes and think of something you love, something or someone that tickles your soul; a child, a puppy, a warm summer day in a wheat field. Now, breathe it in. Breathe in all of that sunlight and warmth and love and preciousness and feel it infuse your entire being and pool at your feet. Isn't it marvelous to breathe? How you choose to react to thoughts of smoking can either increase or decrease their power over you. The next time a smoking urge hits, try a little reverse psychology. Instead of tensing up for a struggle, relax and mentally lean into the craving. Let it wash over you while you focus on your breathing. The urge will run its course and pass. Practice makes perfect with this technique. You'll get the hang of it with time and will find it empowering. Is It Normal to Feel Dizzy After Quitting Smoking? Can You Be Addicted to Nicotine Gum?